Anni e anni alla ricerca del perfecto ideale ed eccolo qui. E’ di Ermanno Scervino ed è la perfezione. Con tante frange sulla schiena e con una pelle morbidissima. Giuro, mi sono follemente innamorata. Con cosa si abbina? Praticamente con tutto. Jeans, t-shirt, camicie o abiti chic ed eleganti, proprio come questo tutto in pizzo e macramè. Ed è proprio il contrasto pelle nera/abito bianco che fa risaltare tutto il resto del look, come al solito il black and white è la mia combinazione vincente. E poi le scarpe, un paio di sandali di Christian Louboutin, pitonati e colorati con le nuance dell’arcobaleno. Years and years searching for the perfect biker jacket, and here it is. It’s from Ermanno Scervino and is the perfection. With so many fringe on the back and with a soft leather. I swear, I am madly in love. With what can you match it? Simply with everything. Jeans, t-shirts, shirts or chic and stylish dresses, just like this, all in lace and macramé. It is just the contrast black leather/white dress that brings out all the rest of the look, as usual, the black and white is my winning combination. And then the shoes, a pair of sandals by Christian Louboutin, with python and colored with the rainbow’s nuances. Wow! Looking so feminine and absolutely breathtaking in this outfit! Great photos! E’ difficile non innamorarsi con un abito simile <3 e poi il contrasto con la giacca di pelle è qualcosa di sensazionale. Troppo bello questo abbinamento. Vestiti corti e abbigliamento alla moda per ragazze. Bloggers Stylizations “. 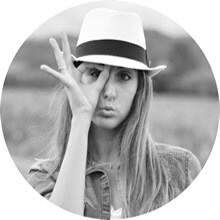 Blog CHIC Poradnik I am presenting styling bloggers.